Share the post "Treatment After Menopause"
Don’t let fibroids cramp your style! Read on to find out how UAE may be able to help even after menopause. 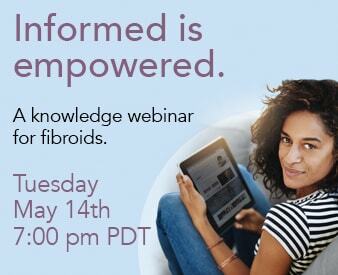 Do I need to treat my fibroids if I already started menopause? The answer to this question is often based on your personal decision. In most situations, fibroids shrink after menopause, so many women find no need to have a procedure done. However, if you are experiencing bothersome symptoms, then it might be a good idea to consult your OB-GYN. Sometimes, women experience symptoms even after menopause, leading them to look into treatment options. Talk with your doctor about these options. Have him/her explain why one or the other is best for you based on your body, age and health. Then strongly consider having it treated if you feel that it is impeding on your quality of life. If your doctor doesn’t explain these options or what they think is best, it might be helpful to get a second opinion. Many women see Uterine Fibroid Embolization as an optimal treatment procedure due to the fact that it is less-invasive than surgical treatment methods and it allows patients to return to their daily activities within a week! The procedure is safe, effective, and quick and women often feel symptoms relief almost immediately after the procedure. If you would like to find out more about UAE or you would like to get some questions answered, please call us at 866-362-6463. You may also Contact Us Online or Chat LIVE, 7 days a week, with one of the our health professionals at the Fibroid Treatment Collective!